Come into fashion with our Made in Italy products! Gardenia was founded in 1961, based on a new vision of the home environment, a vision based on innovation in design and the constant evolution of production methods. In just a few years, it became a globally renowned ceramic group, with an annual production of over 5 million square meters. 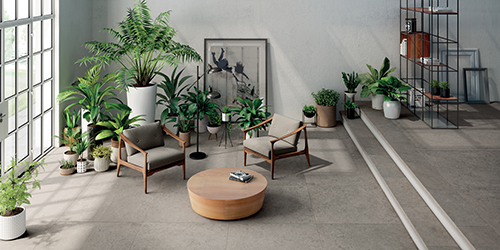 Ceramics are designed down to the finest detail: in constant harmony with evolving styles and always created locally, to maintain the exclusivity and total expressive autonomy that Gardenia is famous for worldwide. Gardenia’s constant research into materials, finishes, decorations and trends has led the company to experience constant renewal. Gardenia group’s production, from design to all phases of the production process, is concentrated in Italy. The company’s history is the history of a country, a language. This is where the innovation and exclusivity of its products come from. And it is here that Gardenia has its home, it is here that in 1997 it began an important partnership with Versace, a brand that Gardenia shares many values with: the importance of design, the unique sensitivity in interior design, the design for change, always at the highest quality levels. 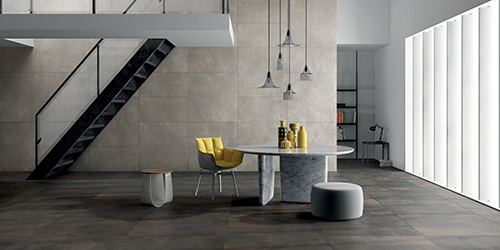 Gardenia Orchidea presents Make The leading-edge R&D of Gardenia achieved the objective of blending the cement look together with the multiple suggestions of the oxidised metals. In Make takes life a unique connection of different materials, which very often come into contact, but rarely are blended into one. Delicate shades create new environments where the living becomes custom-tailoring. The surfaces rewrite the chromatic rules balancing their connection with colours. Creative contrasts re-design the setting. Gardenia Orchidea presents Origini Origini is a range dedicated to those who love to live in harmony with nature and pursue the genuine feeling of materials and of the recesses of the memory. It takes inspiration from the tactile sensations of the surfaces smoothened by the wind, from the nature itself and from the endless colour variations of the stone. It’s a pact made in symbiosis with nature. The stone, origin and first instance, express itself in its most contemporary form. Settings are completely immersed in a natural universe. An intense dialogue between green aesthetic and personality. ETERNO When elegance becomes a philosophy Versace presents Eterno, a ceramics collection inspired by Shou Sugi Ban – a Japanese technique that consists of burning the surface of wood and then treating it with linseed oil, thus giving the wood durability and a reflective quality. The soft and delicate tactile effect of the surface is achieved by advanced, high resolution digital technologies. In a refined fusion of classic and contemporary, the decorative elements contribute to the harmony of the interior design. 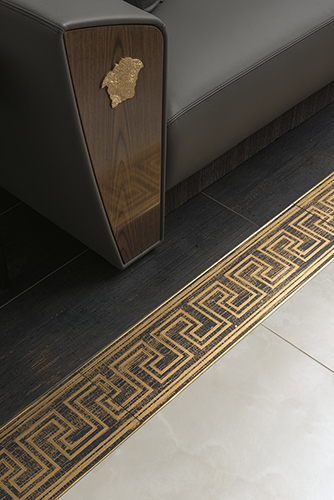 Greca strip and tiles with Medusa gold inlay interact with the surfaces, highlighting the aesthetic of Versace Ceramics. Design, fashion, creativity, art and nature are united and intertwined – creating a perfect combination, a harmony between the proportions and the seductive decorations.